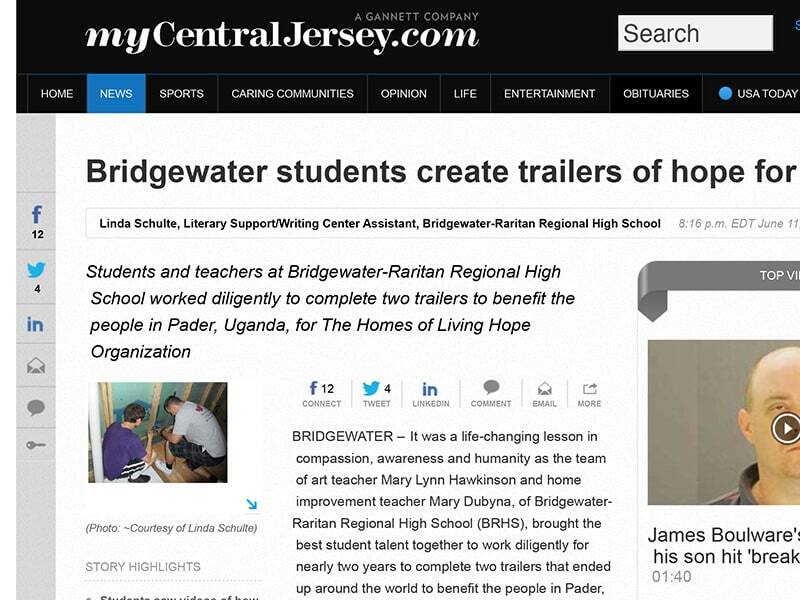 BRIDGEWATER – It was a life-changing lesson in compassion, awareness and humanity as the team of art teacher Mary Lynn Hawkinson and home improvement teacher Mary Dubyna, of Bridgewater-Raritan Regional High School (BRHS), brought the best student talent together to work diligently for nearly two years to complete two trailers that ended up around the world to benefit the people in Pader, Uganda, for The Homes of Living Hope Organization. Hawkinson recruited BRHS’s 22 National Art Society students to assist with designing the murals for the outside of the two trailers, while Dubyna had the vision to have a working classroom by building inside the trailer with his home improvement class since his actual classroom is a computer lab. The trailer would allow his 60 students to apply their knowledge of framing, electrical, plumbing and flooring. After giving the assignment to his classes several years ago to find a group that could benefit from receiving the trailer, one student came up with the Homes of Living Hope Organization. During class, BRHS students saw videos of how the people in Uganda live. This created awareness for them as many students broke into tears seeing how difficult their life is. It also gave them an appreciation for what they have and how they can make a difference. Outside, the trailers were colorfully graced with artwork featuring Ugandan life, with inspiration coming directly from their culture — African women with pots on their heads walking into the sunset, and the crested crane bird as a predominant theme. Inside, the home improvement students did shelving, flooring and electricity, making the trailer completely functional. Pastel pictures dedicated to African life, people, birds and the landscape also decorated the interior. Community Day brought together the BRHS art staff, students and families, as many hands and hearts helped paint and celebrate all that went into the trailers. Lowes generously donated several gallons of paint for the project as well as volunteered their time that day. After completion of the trailers, they were filled with donated bikes, games, books, toys, gardening tools and medical supplies. The 8-by-40-foot trailer left BRHS and headed to Uganda at the end of April. Hawkinson said that it’s like bringing culture to their world, since they’re not exposed to it, commenting that when it arrives, they’re so excited and touch it. Both teachers plan to continue doing the project because it had such an impact on their lives and their students.